Francis meets with the participants in the assembly of the Congregation of Eastern Catholic Churches . 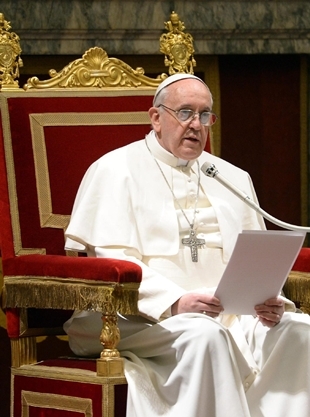 "We should never resign ourselves to a Middle East without Christians." The whole Church is called to prayer that "disarms foolishness and generates dialogue where there is open conflict. If it is sincere and persevering , it will make our voice gentle and firm, capable of being heard even by the leaders of nations ." 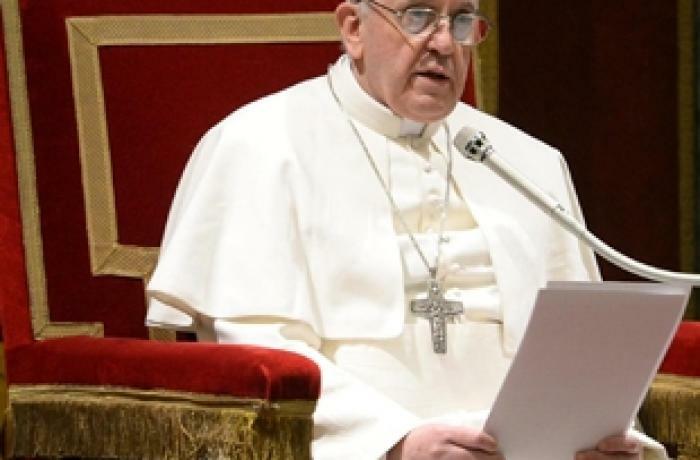 Vatican City ( AsiaNews) - Concerned about the situation of Christians in the Middle East, " the Bishop of Rome will not rest as long as there are men and women, of any religion , affected in their dignity , deprived of the necessary for survival , robbed of their future, forced into the status of refugees and displaced persons". This was the appeal launched by Pope Francis "together with the pastors of the Churches of the East", that "everyone's right to a dignified life and to freely profess their faith be respected. We should never resign ourselves to thinking of the Middle East without the Christians, who for two thousand years confess the name of Jesus, as full citizens in social, cultural and religious life of the nations to which they belong". Francis' appeal follows his double appointment this morning: First with the patriarchs and major archbishops of the Eastern Catholic churches, received this morning in the Vatican Consistory Hall, followed by an audience with all the participants in the Plenary Assembly of the Congregation for the Eastern Churches , in the course of carrying on the theme "The Eastern Catholic Churches 50 years after the Second Vatican Council". "The pain of the smallest and the weakest - said Francis to the assembly participants - along with the silence of the victims, pose an insistent question: "How much is left of the night? "(Is 21:11) . Continue to be vigilant, to the biblical watchman certain that the Lord will not be lacking in coming to our aid. I turn , therefore, to the whole Church to urge prayer, which can evoke from the merciful heart of God, reconciliation and peace. Prayer disarms foolishness and generates dialogue where there is open conflict. If it is sincere and persevering , it will make our voice gentle and firm, capable of being heard even by the leaders of nations". In the previous meeting with the 11 patriarchs, the Pope indicated what characterizes the leaders of the Eastern Churches, "guardians" of unity. Pope Francis went on to say, "In order that our witness be credible, we are called ever to seek justice, mercy, faith, charity, patience and meekness" and with a " sober lifestyle in the image of Christ , who stripped himself to enrich us with his poverty . " "The union, which you are called to realize in your Churches, finds natural and full expression in the 'indefectible union with the Bishop of Rome"(ibid.). "A union and fidelity, he added in his subsequent address to participants in the Assembly "that demands a high price , not infrequently even martyrdom . The whole Church is very grateful for this". The Pope also said that he "has been able to learn firsthand from the Patriarchs and Major Archbishops the situation of the various Eastern Churches: the flourishing vitality of those long oppressed under communist regimes , the missionary dynamism of those that refer to the preaching of the Apostle Thomas , and the perseverance of those who live in the Middle East , often in the position of 'being a little flock ' in environments marked by hostility and conflict . " "In order for our testimony to be credible, we are called to always seek " justice, godliness, faith , love, patience and gentleness "(ibid. ; cf. 1 Tim 6:11 ), to a sober lifestyle in the image of Christ , who stripped himself to enrich us with his poverty (cf. 2 Cor 8:9) ; untiring zeal and that charity , fraternal and paternal, that the bishops , priests and faithful , especially if they live alone and marginalized , expect from us. I think, above all, of our priests in need of understanding and support, even on a personal level. They are entitled to our good example in things pertaining to God, as in any other activity of the Church. They are asking us for transparency in management of assets and concern for every weakness and need. All of this while observing that authentic synodal praxis, which is distinctive of the Eastern Churches . " A thought, finally, for "Jerusalem, where we are all spiritually born (cf. Ps 87.4 ) . I wish every consolation, so it can truly realize the prophecy of Gods final call, from east to west".